We are super proud to announce that, last weekend, we secured our promotion to Division 2 of the British Roller Derby Championships for next year, following our playoff match against Norfolk on Saturday 10th September. To recap, we won all 5 of our divisional matches in this year’s championships against Cornwall, Devon, Surrey, Plymouth and Bath, so we needed one victory at playoffs to secure our promotion. Held in Newark, playoffs involved 8 teams from across the country (South, East, West and North groups) playing to win the title of Tier 3 champion for 2016. The Norfolk Brawds were very co-ordinated in their attack and showed strong offence skills from the start to create opportunities for their jammers to get points on the board and were leading by over 30 points at half time. However, your beloved Kent staged a remarkable comeback, which began in the first 2 minutes of the second half by drawing a penalty which sent the Norfolk Jammer to the box for 30 seconds. This gave us a chance to start scoring unhindered and boosted the teams confidence to help wipe away the deficit and then go on to stage a stunning revival and finish the game victorious at 154-138. We played two more games in a knock out round of the tournament, but our winning streak was not to continue with 2 losses on the Sunday, first against Wirral, who were 15 places higher up the rankings (Final score 73-130) and the overall champions on the day, Swansea ranked 22nd (Final score 123-223). However, it was still an amazing weekend for the team, with such close scores boosting our end of year position on the Flat Track Stats ranking table ahead of our move up to the next tier of play in Division 2. Feeling inspired? If you’re a female over 18 who wants to learn the game and how to skate, we are holding an open day on 23rd October at the Bay Arena in Herne Bay – see our Facebook event for details. 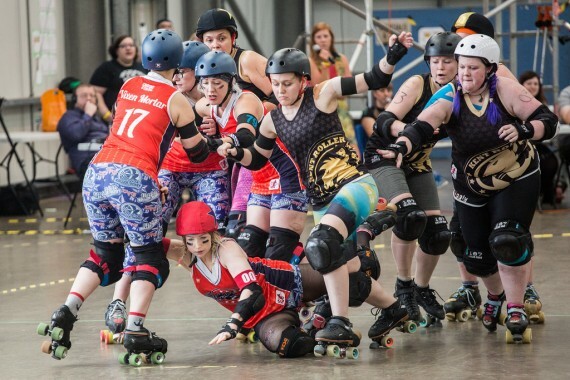 Kent Roller Girls’ last 2 British Championship games were just 2 weeks apart, with KRG vs Plymouth City Roller Derby on July 3rd followed by KRG vs Cornwall Roller Derby in the Championship Tier 3 South final on July 17th. These last two games would determine, firstly, whether the league would be heading to playoffs, and secondly, whether they would be heading there as champions. Kent looked strong from the outset, racking up points before Plymouth managed to get any on the board. Plymouth were determined but only managed 13 to Kent’s 158 by half-time. Despite being the first to score after the half-time break, Plymouth continued to be dominated by Kent as our jammers Tenacious and Foxygen carried on the scoring streak. The game finished with Kent on 277 to Plymouth’s 35. Despite the large differential both teams agreed that it was a great game. This win put Kent at the top of the Tier 3 table and guaranteed us our place at the promotion playoffs in September. After wins against Plymouth, Bath, Surrey and North Devon both teams entered this game undefeated and having secured places at the promotion playoffs in September. The game was expected to be incredibly tight with only two places between the teams in the UK rankings. Cornwall scored first after the whistle, finishing the first jam 2-1. 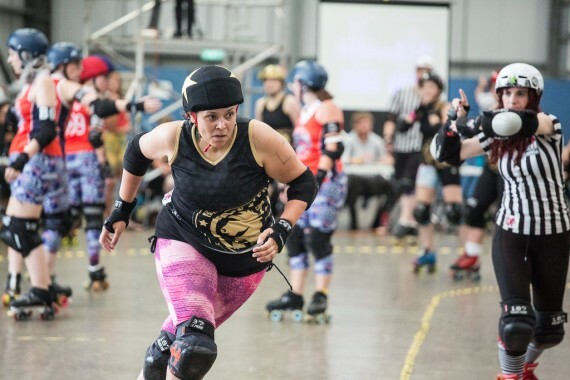 Cornwall had clearly done their homework as they earmarked our jammer, Tenacious, who has impressed in every game this season with her ducking and weaving style, and held her to no points in the second jam. Despite Cornwall’s best efforts, we picked up momentum, adding a few points in each jam. An impressive showing from Bionic Bessie racked up 14 points in one jam as our blockers held Cornwall’s jammer to zero. Kent finished the first half up 101-39. The beginning of the second half brought danger for Kent as Cornwall took advantage of fatigue, gaining 20 points to our 5. Thankfully, after a strategic time out from bench coach Rosa Lethal, we found our second wind. Cornwall continued to fight but we proved too strong for them as they continued their momentum to finish 160-95. We are incredibly proud of what our team have achieved this Champs season, winning all 5 of our games and taking the trophy for 2016. All our skaters have stayed true to our ethos of Hustle, Unite, Commit and have really given their all over the past 5 months. We can’t wait to head to playoffs in September to see what next year holds for us!! 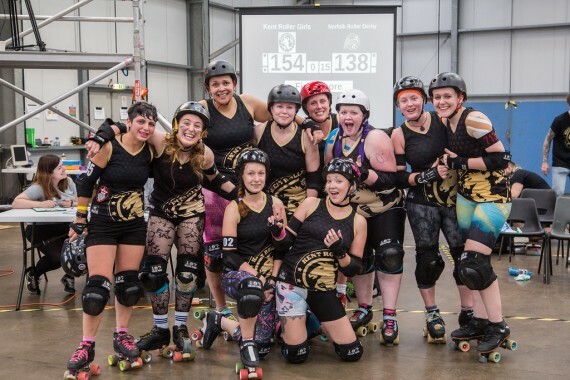 Kent Roller Girls currently sit top of our division in this year’s British Roller Derby Championships following a decisive win on the 23rd April, against Bath. We hadn’t played Bath before as they were promoted from Division 4 after last season. Both teams took a few jams to get into their rhythm but KRG started strongly with an opening 5 points from our superstar jammer, Vikispeedia. We picked up our momentum in the first half and continued to dominate despite Bath’s tenacity, ending the second half 195-27 to KRG. Bath rallied at the beginning of the second half, looking threatening against our defence. A strategic timeout from our amazing bench coach on the day, Demi Lition, helped us get the initiative back. The game ended on an impressive 306-95 to KRG!!! The large score differential puts us on top of the table, ahead of Cornwall who we face in the final weekend of the Championships. We started our campaign for the British Roller Derby Championships in style this weekend (19th March) with a decisive win. The 6 hour journey to Penzance was worth it as we took the win, 219-109, against North Devon’s Grin N’ Barum. This first game puts us second in the table, with a game in hand over the current leaders Cornwall. KRG got off to a great start in the first half as Vikispeedia took 20 points in the first jam. We continued to rack up the points as our defensive blockers held back GNB’s jammer to only a handful of points each jam, allowing our jammers to get through. We finished the first half 151-31. Devon’s GNB came out fighting in the second half, with a strong defensive showing, holding our jammers back, and allowing the Devonshire jammers to claw back some points. We continued to fight on and managed to regain some strength in the final jams to finish 110 points up, more of a lead than we were predicted. “It’s a great start to our season. We’ve worked really hard to prepare for the game and it really paid off” said our captain, Jennapocalypse. We will be hoping for another win when we play Bath Roller Girls in Swindon on 24 April ahead of our home game in Herne Bay against Surrey Roller Girls on 21 May. 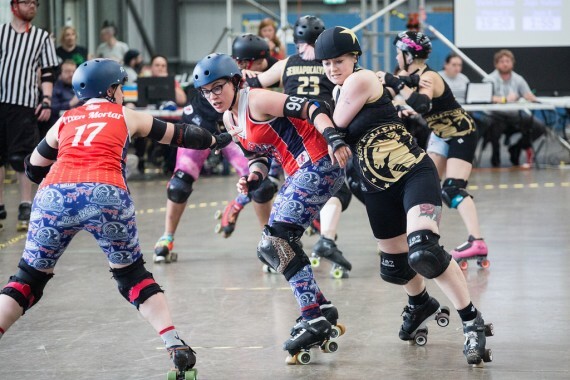 Kent Roller Girls will be taking part in the British Championships again this year as part of the Tier 3 Regional South group. We will be up against teams from Cornwall, Plymouth, Bath, Surrey and Devon over the course of the next 8 months.